It may not be necessary to add locations if the EDD is pre-populated with locations for the field sampling event(s). To narrow down the list of available locations please refer to Location Chooser & Filter. 1.To add a new location in the field, click on the Locations tab and then click the New button. 2.Enter the Location Code using the proper (client-defined) nomenclature for the project. 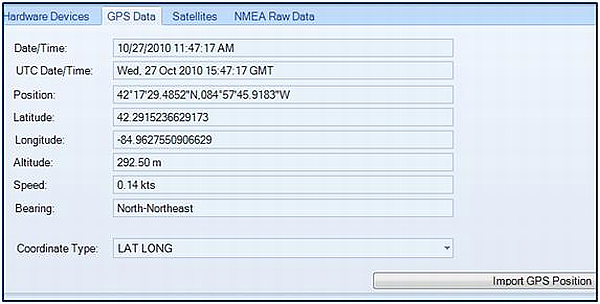 The Location Code may identify the location type, such as a monitoring well or soil boring, and include location descriptors, such as alpha-numeric codes for area and position to uniquely identify locations. 3.If collecting GPS coordinates, in the Location Chooser/Filter, click on the GPS icon. 4.Click the GPS Data Tab to see the latitude and longitude coordinates of your location. You may have to wait a few minutes until you have enough satellites. 5.Click the Import GPS Position button to import coordinates to the location. As shown below, the easting and northing coordinates are automatically added to the location code.